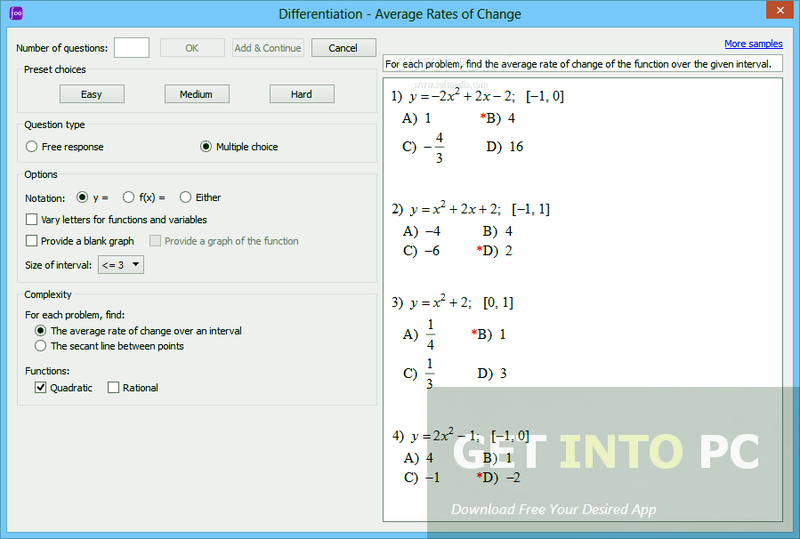 Infinite Calculus Free Download Latest Version for Windows. 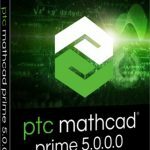 Its full offline installer standalone setup of Infinite Calculus Math Software for 32/64 Bit PC. 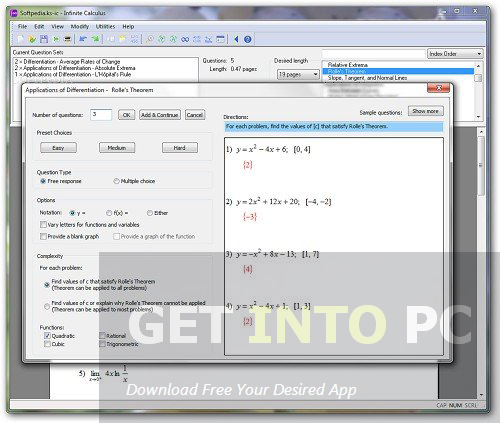 Infinite Calculus is an application with which you can generate assignment sheets for tests as well as for home work. Infinite Calculus with its multitude questions from several categories and custom level of difficulty is one very handy application. With Infinite Calculus you can generate a list of problems like integration, intervals and logarithm etc. 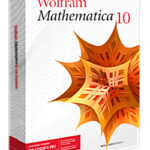 You can also Download Mathematica 9 Free which is another great alternative. 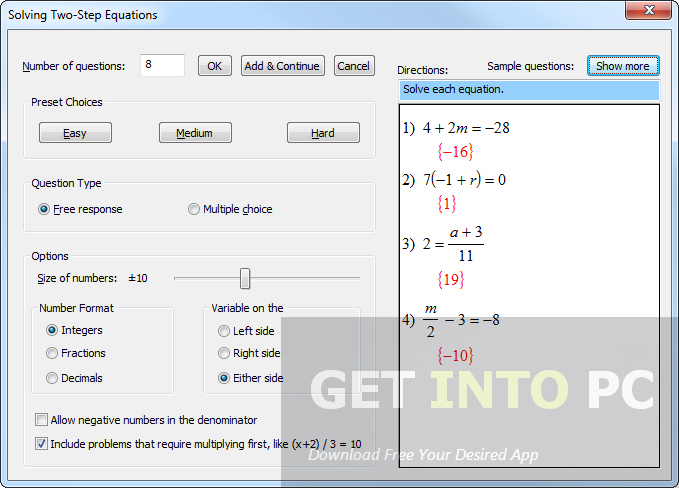 With this software you can add a custom numbers of questions with 99 being the limit from each category. All you need to do is to simply select a topic and then enter the desire number of question you want your software to generate. After this you need to select the desired difficulty level. Infinite calculus will also permit you to set different parameters which includes size of the font, color of the font, type of the font and some contents from the header. You can also take the hard copy of your questionnaire. You can also save your project for further editing and you can also get different versions of the same question paper by scrambling the questions. 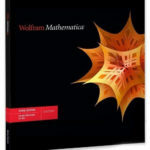 The software covers all the fundamental concepts of Calculus like limits, differentiation, integration, continuity. The software has been developed in such a way that anyone of any level whether beginners or advanced can use it with ease. Below are some noticeable features which you’ll experience after Infinite Calculus free download. 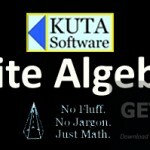 Can generate worksheets for test and homework. Contains multitude questions from several categories. Can generate a list of problems like integration and logarithm. Can different different parameters like font type, size and color. Can take the hard copy of your questionnaire. Can getting different version of the same question paper. Covers all fundamental concepts of Calculus. Handy application for both beginners and advanced users. 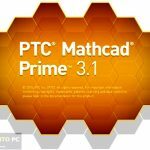 Before you start Infinite Calculus free download, make sure your PC meets minimum system requirements. 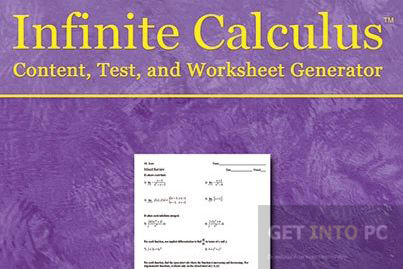 Click on below button to start Infinite Calculus Free Download. This is complete offline installer and standalone setup for Infinite Calculus. This would be compatible with both 32 bit and 64 bit windows.